Millenia before the GRoF a single volcano caused a large section of cells of the Megalith to rupture on a horizontal plane reaching from the sea in the east into the southwest mountains later to become the Broken Lands. The rupture was filled from underneath with magma and new cells, this lifted the plateaux up, long before this region was discovered. 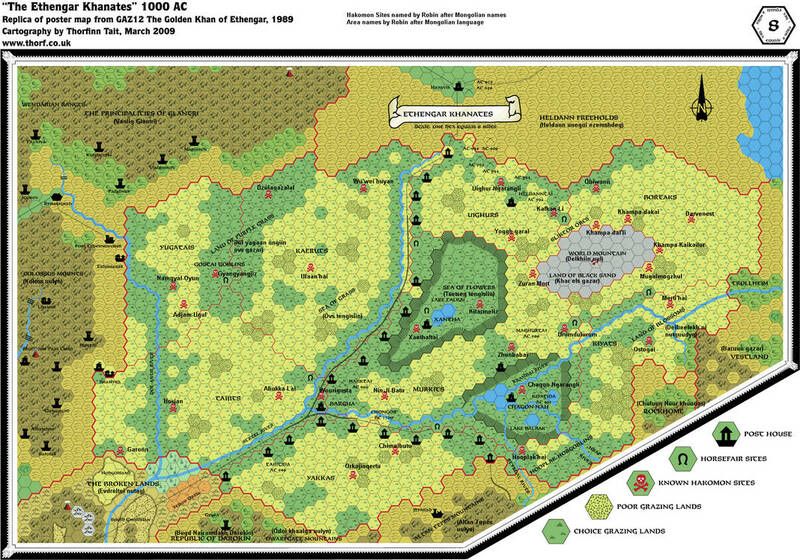 Before the GROF most of the 1000AC Hakomon locations did not exist, and the few who did were simple natural magical locations with variant effects, like any other on Mystara. Settlers from Blackmoor created the New Blackmoor Colonies. The dormant or assumed dead volcanic Mountain in the middle of the fields of Ethesh was proven to be rich in minerals and a mineral mining and plant for Carbonatite and other ores in the long ‘dead’ volcano and nearby city Grassdale were created. Transport was done manually, and by horse first, and later by various metal cars, and vessels along the rivers, and also by the Radiance lines (see Sturm; viewtopic.php?f=3&t=20277 . The volcano resembles more a single huge hill than a mountain. the top is at 3500 Feet, while the graaslands are at an average of 1400 feet. Lake anur is at 800 feet. There are secret magical planar researches conducted on the mountain and on several locations in the land of Ethesh. 3000 BC; GRoF obliterates Blackmoor; the Planet shifts, Ash and Dust causes the land to be covered by ice and snow.. Ice recedes from the Steppes. Spirits are drawn in to merge with the world. Around 2300BC; Moadreg Dwarves locate the city and mining ruins of Grassdale on the small mountain. They do not know it is a 'dead' inactive volcano. like the former Bkackmoorians the delve for Carbonatite and other Minerals. Their use of Radiance magic is great and soon affects most of the local sources of magig. There are even Interplanar disruptions due Dreamwalking and Shadowmancy each connecting to the nearby Sphere of Entropy and the Spirit Realm. (see Chimpmans great work here; viewtopic.php?f=3&t=1389) Moadreg Dwarves of this time were masters of the arcane arts (and a little dark and possibly crazy). Most magic in the Shimmering Lands was powered by the radiance – a magi-technical substance discovered and developed by the ancient Blackmoorians. Conventional wisdom often linked use of the radiance to the cause of the Great Rain of Fire, as well as to the Wasting disease that followed after it – a theory studiously ignored by the dwarves of the Shimmering Lands. The Dwarves also used techniques binding the souls of fallen enemies to weapons, armor and constructs. Other magical techniques like Dream walking and Shadowmancy were also part of some of the locations of the Moadreg. This will be reflected later in the magic of the Hakomon locations with a Moadreg history. in BC 1800; After the dwarven people get remade by Kagyar the Shimmering Lands were long forgotten, the Moadreg estates Thaghdyt, Drynneg, Heldfyst, Amlysk, Bargdah, Lumeck, but also Ford Kairhyeld, Ruins of Layhash and Hrokydran will continue to radiate a menacing or magical (disturbing by Radiance) presence. When in 1700BC elves caused the RCC collider to explode (see https://breathofmystara.blogspot.com/20 ... overy.html) the volcanic activity is increased significantly; First the pressure cused from the RCC collider and the exploding cells, passed through the weaker horizontal layer of cells and caused a massive increase in magma. This caused a greater tilt of the plateaux (down towards the southwest and up in the east). Secondly it reactivated the dormant (assumed dead) carbonatite volcano in the Hrokyrdran Mountain. Thirdly the explosion draws to Interplanar connections (drawn nearer by the GRoF in 3000BC) into contact with the Prime Plane. This becomes centered on the Moadreg magical works of Hrokyrdran, as if already attuned to eachother. The World Mountain comes to be with a gate to the Spirit Realm on top, and a multitude of Entropic ruptures from the Sphere of Entropy spawn nearby in the Lands of Black Sand and on magical locations further away on the Plateaux. This process continues up to today. Most of the smaller ruptures existing solely in the Lands of Black Sand come and go a few weeks or days later, chaotic as Entropy is. Bound to the natural, the Moadreg created, and all the later spawned magical locations these locations seem to be permanent, emitting their magic mixed with Entropic influences on either a constant or repeating pattern. Most Moadreg estates should probably conform to standard dwarven estates of this time (a central compound reserved for the dwarven master and ancillary workshops and living areas in the surrounding countryside). The compound/stronghold in the center would be where most of the magic and power of this time is stored. Most of these sites are partially to mostly destroyed, or in some way buried or covered by the ravages of time, although a portion of their power remains (and can be made use of by those brave enough to explore these sites). Last edited by Robin on Sat Jan 19, 2019 2:39 pm, edited 5 times in total. One by one I will reveal the Hakomon locations as best I can. 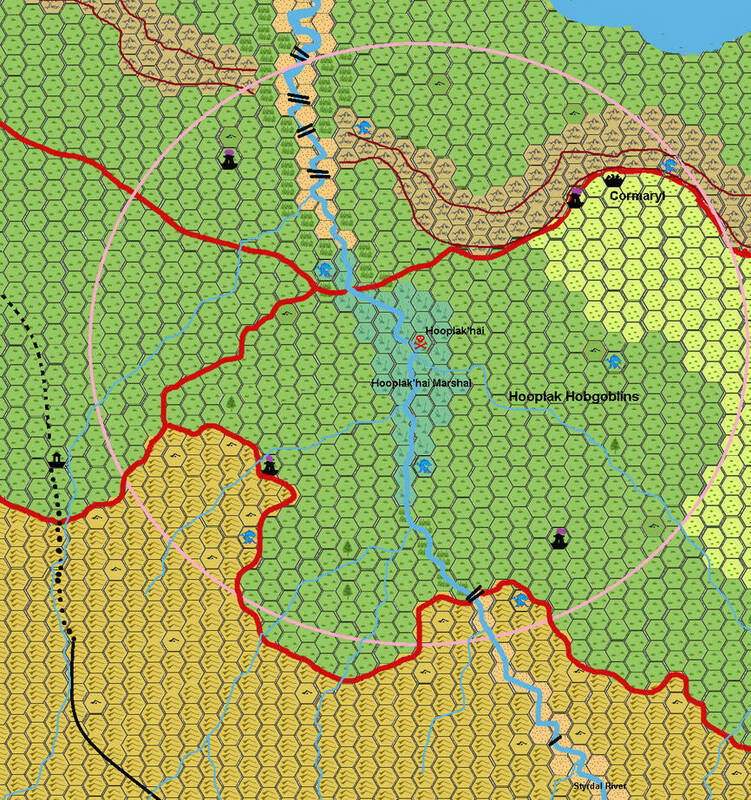 The 1 mile hex maps are to large to place here, so these will be links. Any supporting art is also aplied as a source link. Last edited by Robin on Sat Sep 29, 2018 12:39 pm, edited 2 times in total. Known for; its ring of corpses (which animate at night walking in a circle so the grass declines. Exists since 0AC; The last dead trees had fallen north of the still shrinking Grondheim Lake. The Anur Lake was now only about a quarter of its large size, but now had a vast swamp of its former size around it. Within this swamp (north of Akkila's Throne) the Hobgoblin Wokani discovered a new Magic location, which they called Garonn. The location was most logically being a by-product of the 1700BC disaster, yet was fully inundated and its effects suppressed. 500AC The Grondheim Lake now holds a small lake of 30-40 miles and a double area of swamp. The remaining sections of the former lake have slowly been taken over by the grasslands of Ethengar. And within this grassy encroachment, the Ethengar warriors followed. They went towards the Magic Location owned by the Hobgoblins; Garonn (renamed by the Hakomon Its-Jongha Pabulai after the first Hakomon activating powers here). The force had several Hakomon magicusers with them, who soon discovered the power of this location. The humanoids were first forcefully driven away, up to "their" plateau. The nimble horses of the Ethengar were unable to traverse in the rim of Broken Lands. And their attack was halted. 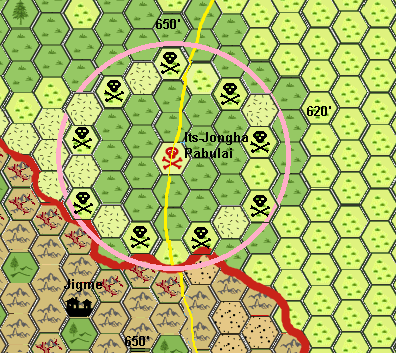 Up to this day the Ethengar tribe of Taijits regularly patrol this region in a (feeble) attempt to keep the Humanoids out. However, the Hobgoblins know more of this location then the Hakomon do. An agreement, a bitter one, but still, was made; Both Hakomon and Hobgoblin Wokani would keep using Garonn, and within the area itself any combat is refrained from. It may be weird and even strange, but here the Hakomon and Hobgoblin Wokani may even work together, while battling each other outside the poor and good grassy circles. Sphere of Influence; 3.7 mile radius. Holds two ancient village ruins; the eastern dating back to the Blackmoor Era, the western from 2300BC. Known for; its enveloping high reeds and encircling crystal growths. Exists since; Unknown-several centuries before the GRoF(estimated shortly after the Blackmoor colonists first arrived here). An old Witch pond between two Blackmoor villages was used before the GRoF to create temporal magic to heal and allow growth. It also enabled a greater longevity. The pond did exist even when Aral Lake was at its largest size, just along the coast in a fork of the Dol Anur River. In 1700BC the lost power was reactivated, used since 1685BC. The location was most logically being a by-product of the 1700BC disaster merging water (temporal) magic together with Entropic magic. Effects; Visions of the Past and Future, it still holds healing effects, but now with a cost, on the principle; heal one hurt one. In effect chaotic nature magic unaffected by the Day(s) of Dread. In effect any healing will be affecting the first healthy and unharmed similar race creature entering the area as harming. Hakomon know this and use slaves or criminals as receiving subjects. Sphere of Influence; 7.4 miles radius. Last edited by Robin on Sat Jan 19, 2019 2:44 pm, edited 6 times in total. 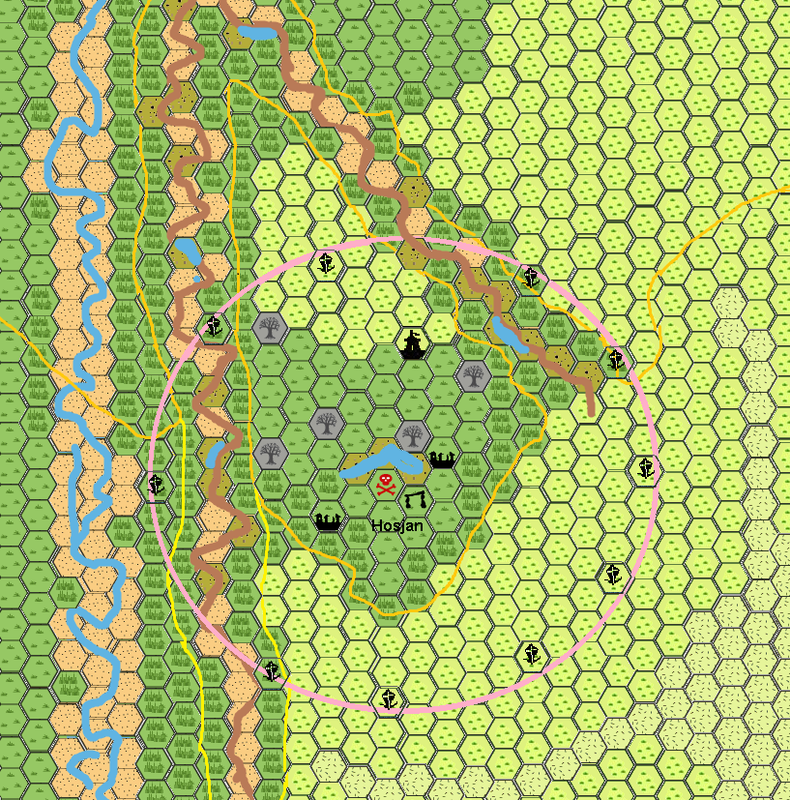 not only I have to compile all canon/fanon information and conform this into something useful, I also have to make these on the 1 mile hex map ..with enough detail. Very cool. I haven't given much thought to Ethengar, so I can't really contribute much, but you're doing great. Also called Mastodon Rock by Travellers on the Overland Trail. Closest Hakomon location to Bargha (8 miles)Actually at the feet of the hill Bargha is set up upon. (this is canon as per Gaz12). Mostly known for its peculiar Mastodon Shape, and the constant fogbank centered on this location. The fogbank expands even beyond the Sphere of influence along the River towards The Rock(see grey line on map). Druids say this fog is the only reason some sparse orchards of fruit trees are found here. Do not expect orchards like elsewhere, these are more wild stands of fruit trees; plundered once a year in Demai and Chagai (Ambyrmont and Sviftmont). Although not restricted, most Ethengar are afraid of the location , and forcefully insist any desiring to enter the area to leave. Legend; The Ethengar speak of this rock as the largest creature ever existed; the Mastodon, This friendly beast wandered the plains for thousands of years ignorant of the Immortals. The creature entered the eternal fog and ate of the trees Tubak had given to the Ethengar. Tubak ordained a punishment and Cretia gave it. The creature was turned into stone. Of course this legend has no merit; other than that Pachydermions have visited this area before and like the Mastodon (which is a Forest creature) disappeared while the trees around Aral Lake died and where cut and used. Exists since; Known to be used by Hakomon since 1622BC. Known to exist much earlier, some say even before the GRoF. The Elephant shaped pure basalt rock is no coincidence. This location was used as a beacon for Pachydermions of Patera to Transport (unknown how; possibly some Teleportation) before 3050BC. The powerful magic was affected greatly and fused Matter magic together with Entropic Magic. Pachydermions sometimes still arrive here and intend to trade, they are treated almost as gods, although they are know to be able to be wounded and thus die. When they arrive they are always invited to visit the Golden Kahn. The Pachydermions are unaffected by any of the Entropic effects in Ethengar for unknown reasons. Effects; Other than being a conduit to Patera used only by the Pachydermions and Rakasta of Patera, the region is affected by the Entropic force of the Sphere of Death like all other. Any humanoid creature being alive (and not originating from Patera, being Fairykin, Hakomon, or a shapeshifter) will suffer a random taboo for a full year as given in Gaz 12 Player book page 12. The violation punishements are chosen by the DM last until removed by a day of meditation and contemplation. Sphere of Influence; 2.5 mile radius. Eternal fog seems attached to river flowing downstream and being 50' high above the water, and 10' high 2 mile away from the water. The mist continues until it reaches the rock and has a varying density depending on the local moisture. The dryer the air, the more one can see, during rain the density is thus thick one can't see further than 10', in dry circumstances this is to 500'. The DM decides the visibility here. There are several caves along the Overland Trail's side, within they all convene and lead to the giant trunk into the water.It is here the Portal to Patera can be opened by Paterans only. Hakomons can cast more powerful Conjuration spells when meditating here (as if the spell was cast by a Hakomon of 4 levels higher. Creatures conjured have +4 hp/HD,). It also gives them a 5% bonus when creating magical items, brews, potions and such (not scrolls). The Hakomon is however more vulnerable to all petrifying effects and suffers a -2 on all needed saving throws. Last edited by Robin on Sat Jan 19, 2019 2:46 pm, edited 2 times in total. Was the idea of Hakomon Sites metnioned anywhere or is tht your creation? In any case, very cool. Could other spellcasters make any use of these in your opinion? The Hakomon sites were displayed on the Ethengar map, and there was some minor mentioning in the Gazeteer itself, but there were no descriptions or any. As digging through the various canon and fanon sources as well as Mongolian legends I could base things on I created these from these sources. for example Elephantmen were known in Mongol legends,a legend source/fairytale dating back to the early chinese history...I saw the resemblance with the pachydermions hence this example. similarly I create the others. In my personal opinion magic users of any form (aka Mages, Wicca's, Wokani, Hakomon, Witches, Elementalists, and I even accept Fairy(kin) and Dragons), however, most of these locations are restricted access out of fear and competition; first Glantrian mages (and thus almost any mage looking like a glantrian aka using a book)are killed as soon as discovered, and especially near these centres of fear. Secondly; Hakomon would ensure this restriction would be enforced, otherwise they would have competition. some locations are already shared between Ethengerians and Humanoids, and within the location this is accepted, but beyond these are attacked by both sides. (see Its-Jongha Pabulai aka Garonn for example). In my opinion the restriction is not a natural but a sociological or even cultural one. As magic locations exist in many countries (for example Canolbarth)as per variant canon sources and I assume by the variant Fanon (for example Alphatia, Thyatis, Ylaruam) these magic (and antimagic spots)would be found almost anywhere. Especially on magic disturbed locations as Canolbarth and Ethengar, where these will be uch more prominent. I personally see these areas as biological reactions of the Megalith Mystara on magic disturbances, disasters, radiation, and such. as such any heavy volcano, meteor impact, sunken continent would (and it seems they have sometimes as per canon (PC3)) have several of these, yet they were never explicetly displayed or even explained...and here I come in...or at least now for the Hakomon locations first. I have btw already infused many of these in my 1 mile hex maps, the Alfheim Evolution, and similar. Echo support . I like how you are fleshing out the individuality of each of the sites. Just went through to map the Ethengarian names from your map to the dwarven names in the Shimmering Lands map. One of the names that jumped out at me was Mugulmogzhul (formerly Amlysk). Of course the "zhul" at the end of the name immediately made me think of Zugzul (who was worshiped in the Shimmering Lands by the dwarves and gnomes at the time). I wonder if Mugulmogzhul could still have some connection to that forgotten immortal. Exists since; 1700BC The Dwarves of Rockhome had a turbulent past, and many wars. One of these was with a gigantic wurm-like creature. The battle was great as the creature used powerful magic to attempt the dwarves to be slain. The magic resistance of the Dwarves made them fight much harder and much longer than expected. They say several dwarven armies fought a constant fight withdrawal battle for over a decade, giving the creature no rest. Eventually they succeeded to force it out in the open fields of Ethengar. Working together with the Ethengar tribes here they did not want this monster to survive and haunt the world for how long it might be. They used their seismic detection methods to see in which direction it burrowed, continuously move in front of it, attacking it with full force as soon as it surfaced. The many Ethengars in the region did help the dwarves getting in front of the monster with their swift horses. Whereever it popped its head up up the ground became a wasteland, even when it was forced down again. The whole region was affected as the fight became more concentrated, and became poor grassland. Where the creature passed on land the ground lost the ability to allow any vegetation except a spase Thornbush or pollen of grass. The ground was dug in as strange gulleys on many locations (long collapsed in the centuries following by rain, wind erosion). Unknown to either combatant at the same time some elves triggered an unknown Blackmoor device and literally blew up the region now known as the Broken Lands. In the dust and mayhem, the thousand dwarves and Ethengars saw their opportunity. 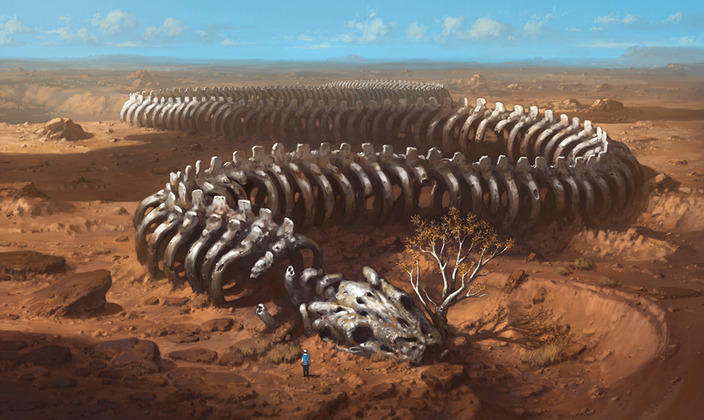 The single creature could no longer see, could no longer use magic, and in the dust of the explosion, the creature no longer knew up or down, left nor right, writhing its large gulleys in an attempt to escape the multitude of attacks it perished under the combined might of the Ethengar and Dwarves. The Dwarves (no longer aware of the magical usefulness of the creature) took some souvenirs (mostly teeth), collected their fallen and returned home, leaving the creature to rot away. Some say it was the Midgard Serpent the Northern Reaches people still talk about. Whatever it was it was no more. Today the skeleton (which proves it was not an insect or wurm, maybe it was a Burrower) and the gulleys it created in the battle form this location. It was used as a Hakomon location since 233AC, before this the Ethengar (who lost many of their people and horses in the fight) did not dare to approach it any nearer than several miles. The body still radiates powerful evil magic; similar in effect of that of a Burrower, but no longer has any consciousness. The soul of the creature (if it had any) passed on or was obliterated in the battle as the Dwarves used many Dwarven Clerics imposing the might of their Immortal upon it. If the magic originated of the creature, was affected by the Blast in the west, was later affected by the corrupting magic from the Sphere of Death, or any combination thereof, the effect is the same; a long skeleton radiating powerful evil but still tempting magic. Effects; The controlling spirit of the creature long gone, its magic did not wither away. Instead it was kept fed by energy from the Sphere of Entropy. Undead do not have to fear any turning Undead in this area, for not only is the area blighted, it is blocked out from the other Planes; this means there is NO contact possible with any other Plane, thus no summoning/conjuring Planar Creatures, no contact Outer Plane or similar spell will work, Clerics, Shaman, Shamani, Druids, or any other clerical subclass will not be able to gain spells from its Immortal (Except the 1st and 2nd level which come as per Nightwail Trilogy from the Character’s own piety). Immortals know this area to be a blackspot, where even they can’t see; hence they keep an eye on its borders. Any translocation/Teleportation spell will also fail and prompt the character roughly (3d6 damage) at the border of the area. 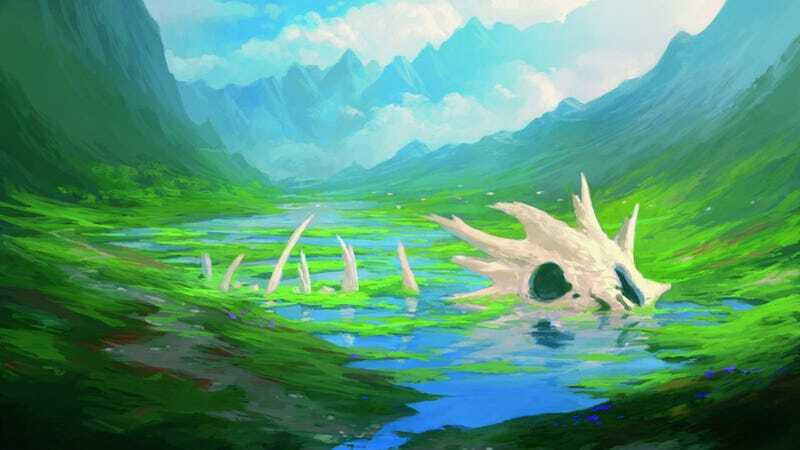 Although the magical area is a sphere, the devastation the creature created those days still affects the region miles further away. As such it is dry, sandy and dead. Any Wokani (or any other class with the ability to control) is able to control DOUBLE its normal limit in Undead. Most dead remaining here are skeletons, zombies, and undead skeletal horses, but there are also about 20 Wraith and at least 6 Spectres, nearly all of Ethengar descent and with similar weapons. Sphere of Influence; 4.7 Miles radius. 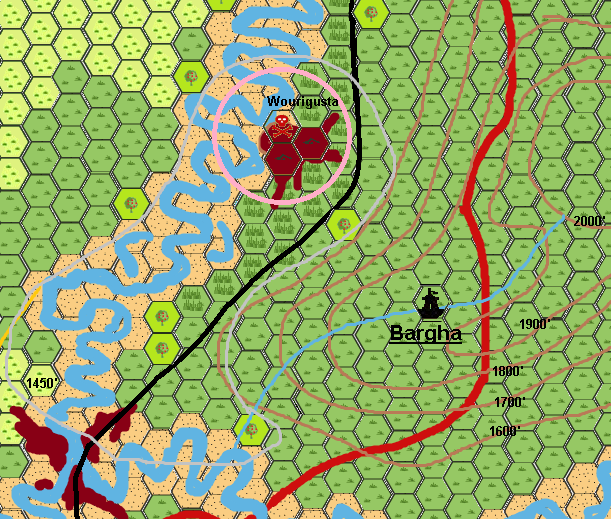 Apply Heat exhaustion rules as per (HWR2-TSR9339-D&D-Mystara-Kingdom of Nithiain) in this area, and the barren region near it (including any sandareas, wasteland areas, and poor grazing ground areas. Any other grazable land is only warmer than normal (5-15 degrees) but does not imply a heat exhaustion trigger check. Last edited by Robin on Sat Jan 19, 2019 2:47 pm, edited 2 times in total. Used by; Shaman and Clerics of Cretia as an atonement or test area. Used also by Hakomons. 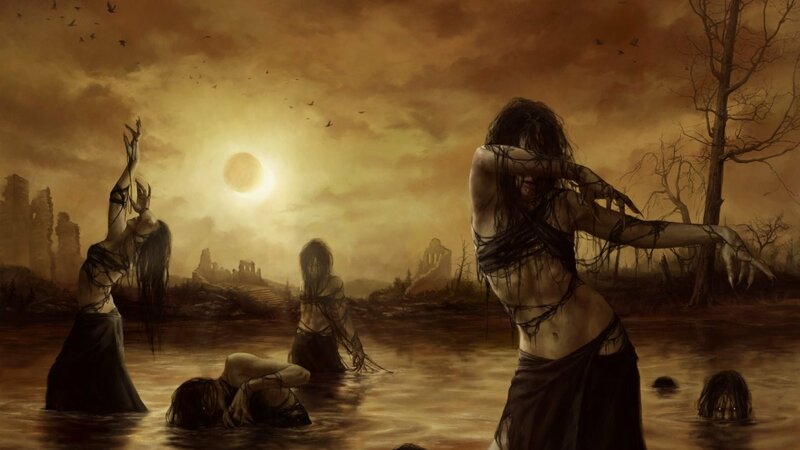 Legend; Cretia Lord of Chaos and Mischief maker disturbed a meal(or congres) of Terra and Tubak. They insulted him for doing so. Infuriated Cretia stomped down his foot, and created the continuous Vortex we know today on the location of the meal. Within they eye of the storm all seemed to remain as was normal, yet when they decided to leave they encountered the fury of the footprint of Cretia. Moving against the wind (ie. going into the circle) is at 25% normal maximum, and requires a constitution check each hour or become fatigued (-1 to saves, THAC0, AC, and movement reduced a further 33%; restored after 2 turns of rest) if not resting roll a succesful con check each round or become seriously fatigued= SV, THAC0, AC-2, MV slowed another 33%, rest 1 hour to lower to Fatigued, if not resting roll a succesful con check each round or become Exhausted=SV-3, THAC0-2, AC-2 or more movement 0,recover to seriously fatigued after 4 hours of rest; if not resting roll a succesful con check at -3 each round of action or become KO for 10d10 rounds) and still exhausted. Moving out of the circle is at normal movement rates (unless flying see above). The crystal symbols desigated a mile large patch of glasssharp crystals; traversing through these unprotected causes 1d8 damage for each 100 yard crossed, subtract Armor Value (or if not using Armor Value rules; the AC improvement a spell or Armor gives from this damage-0 damage is thus possible with the right preparations). The crystals are a natural reaction of the planet and in fact absorbs most of the magic effects, and make it possible to exist within the area. It however also keeps the vortex being able to give damage as desribed above. Movement within these areas is 100 yard per 6 Turn (60 minutes!!) maximum, thus crossing a crystal hex of 1 mile (1760 yards) will take 17.6 hours!! The central area is a very fertile ground with a 360+2d100 feet high warm water geyser erupting each 13 Turns. here the wind does not have any effects. This is also the one safe location where miditation, concentrating or praying has no penalties. However reaching this area is a feat/quest on itself. The geyser gives 1d6 boiling damage if touching this water, but gives no damage when the water falls down again (it is cooled by the storm. Sphere of Influence; 7 mile radius. Entropy, Air, Chaos. Within the area Meditation and praying needs a meditation check for Hakomon and mages (at -4), or an intelligence check at -8 to be successful. If successful any weather, wind, climate, cold spell will have maximum duration and a 25% chance it will not be lost from the mind if cast (as normal it will still be lost of sleeping or knocked out). Any such spell needing concentration can now be continued within 1 round per 8 levels of the caster if the concentration is broken and an intelligence check is successful. Instantaneous spells will have 1dice extra damage or effect as per spell. Shaman must have a piety of 16 and must roll a successful Wisdom Check at -4 to receive any benefit as described above. 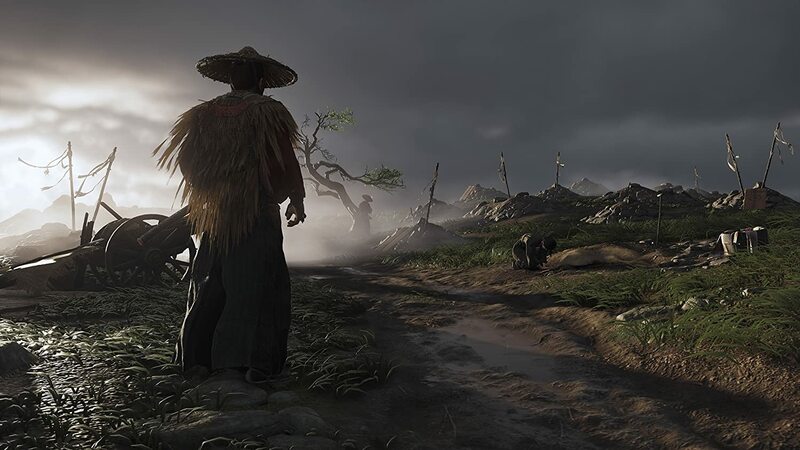 Only if the Shaman (or Cleric or any other follower of Cretia) has a piety lower he can regain lost piety at the rate of 1 point for each hour praying within the central area. Last edited by Robin on Sat Jan 19, 2019 2:48 pm, edited 1 time in total. This is fantastic work. I love how you are developing this. By the way, what do you mean by “Piety”? Thanx. These responses I also enjoy. as those bringing more information. I had forgotten to add the Piety link so here it is. Piety is the ammount of Faith, religious belief and willingness a character has to follow an Immortal (or sometimes group of immortals). it dictates if someone is receiving spells upon prayer, and penalties if doing faulty things in the eye of the Immortal in question. The more Piety, the more powers a follower or servant(aka clerics etc) may receice. In the above example the characters may go to Nin-je-Batu to atone; atonement removes penalties for bad behavior, and the character thus proofs he/she is willing to follow the immortal anew. As in the eyes of Cretia Lord of Chaos, this location is perfect. Other immortals may just enforce a ritual or such, or may have similar ardous or dangerous rituals. The spell Atonement is used as a primer to begin such a ritual. Centre located 8 miles south of the Chagon-Nah depression, but fully encompassing the Dol-Styrdal rapids at the south of the Chagon-Nah depression. Know for; its eternal storms and precipitation, and the Huge skeleton of a Blue Dragon within the river. Unknown but seen be anyone here and perceived as reality, is the illusion of the Altan Tepes uulyn (Altan Tepes mountains) being closing in on this valley. Those who entered always remember they entered the region through this valley, even if they did otherwise. This powerful illusion is only negated by Fairykin and Dragons (actually anybody possessing Second Sight), and any hobgoblin born in this region. This illusion causes many to become lost, or when they retrace their steps until outside the area of effect, suddenly forgetting any how the area looked a mere moment ago. The illusion is actually an old image further up in the valley, and thus seems so real and disconcerting. Exists since; The exact date of this happening is lost in time, however, it must have happened somewhere before 1691BC as the War of Succession begins. The Plains of Ethengar always had its interest by the Blue Dragons, and one of them had grown from the 2300BC era up to a huge shape, and controlled all of the plans almost up to the Glantrian borders. The dragon was named Tsenkher luu (aka Blue Dragon), and it ascended to Dragon Immortality somewhere around 1691BC. As Dragon 170 explains; When a small chaotic dragon becomes a large dragon, a violent storm hits the region, causing great fear and some damage. When a large chaotic dragon becomes huge, a devastating earthquake rocks the region, possibly causing volcanoes to surge from the earth and erupt. Upon the ascension to Immortality of a chaotic dragon, all of these signs occur. A wave of terror and destruction is inflicted upon the region as well by all the chaotic dragons that are now free from their magical bonds and eager to celebrate the event-or go to war against each other. World Mountain did erupt regularly between 1691BC and 1660 BC, and expanded greatly. The storms raged over the land and there was no Ethengar not afraid of Blue Dragons. Great combat and destruction caused the Ethengar's initial growth to slow down for a period of about 30 years. This time was known as the War of Succession. And then they had to rebuild. It may have been this period which instigated the ethengars to become a truly nomadic people, as what you take with you can't be burned or destroyed, and can more easily be repaired or exchanged, than common buildings. This Ascension of the Dragon Tsenker Luu created the Hakomon location later known as Hooplak'hai south of Chagon'nah due the Dragon magic binding with The Entropy of the Sphere of Death. Effects; This location is the largest Hakomon location beyond World Mountain. Its size and powers cause most of this region to become near to impassable. 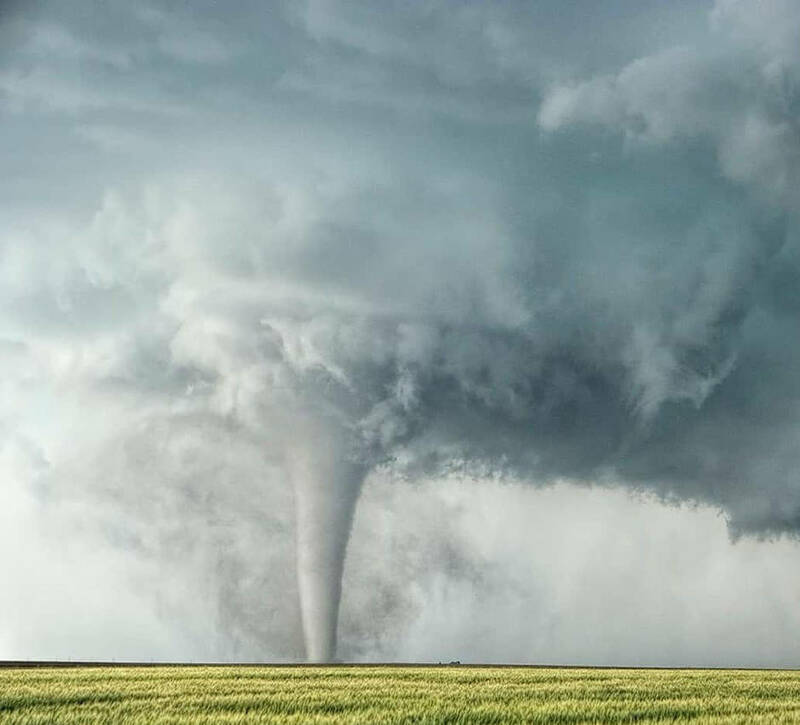 There is always a rain or thunderstorm storm raging in this location but beyond its area of effect the winds are as normal as anywhere else on the Plains. Those born in this region are immune to the illusions and have a 50% to detect any illusion on sight, illusions based on other senses at 25%, and thus may disbelieve each illusion detected as being one without effects. As the Hooplak Hobgoblins reside in this area it is best to assume 50% of each Hobgoblin of this tribe is born in this region and may have this ability even if later living elsewhere. Of course young hobgoblins (or other creatures) born and living here still always have this ability. Sphere of Influence; 14.5 mile radius. Entropic magic, Dragon magic, thought magic. All Illusionary spells meditated here (at -2 on memorization skill, or -8 on int check if not having this skill, this due the distraction of the weather), will seem to be thus real they can’t be disbelieved (if a character “died” due the effects of such an Illusion, the character will awake after 1d20 hours and totally forgot what did happen, and as there is no proof on his body, nobody can proof him otherwise. Any “wounds’ will just seem to have healed). Any dragon settling within this region (there are 7! Known, gain 1 spell more for each spell level they can cast (ex; a dragon able to cast 3 first and 2 second level spells can now cast 4 first and 3 second instead). Spells influencing weather, climate, temperature, lightning, or protection against these meditated here are thus disturbed the caster has to relearn the spell totally new, as if he never knew the spell(s). In the upcoming years this location will finally shrink and eventually disappear. The draconic powers created by the Ascension of the Blue Dragon, finally fade away, and as the Sphere of Death was bound to it, this will end too. The Sphere of influence will gradually shrink and fades completely away on 01-08-1039AC at 21:36 as per table. Last edited by Robin on Sat Jan 19, 2019 2:49 pm, edited 3 times in total. I like this last one - the idea that its powers will shrink over time and then finally end, is pretty cool. As an aside, these entries remind me of the old 3E mechanic for Touchstones, which would allow a character to become the "master" of some site or location, and to gain benefits from such mastery. This feels very much in line with the "magic sites" of Mystara (in Ethengar, Alfheim, and other places). I will try to contribute for Layhash/Khampa-kaikailur in the format you have provided. Working on something now. But I know some nice material is found in any version, I have to search it up and check...maybe I can pull something out of this. Located 9 miles northeast of Chagon-Nah in the Chagon-Nah depression. Known by; the dead lands, the dead marsh, dead forest, and mudmarsh around it. "As if life itself had died here" the Ethengar say. Nobody beyond the Hakomon, the mad, dying and stupid dare to enter this region. 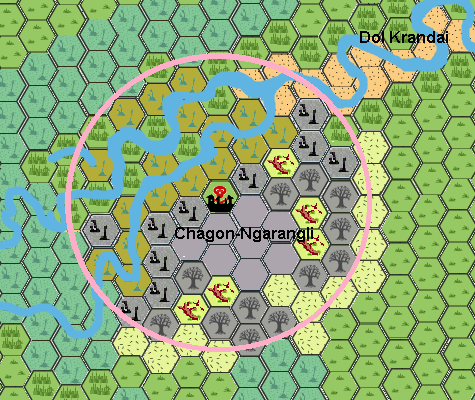 As I created the base for the Hakomon location of Chagon-Ngarangli....I entered the region in my mind, and it feels weird, and dead....As I mentally wandered around here in 3d with senses in my mind. and I suddenly knew what did happen here; a battle of the spirits, around this old village ruin (i haven't decided what era yet 2300BC?, 3050 or earlierBC, or else--I know of the Dragon Lord Chronicles mentioning a village with spirits, so I could use that reference, making it at least 500AC, but i feel much older). I have to further detail this and write it down ...somewhere this week. when looking for images of a battle of spirits, i found this image, and it suited well,I only was inspired by the computer game image, I will bring this location back to Mystara/Ethengar/Spirits. Does anybody remember the notion of a village of spirits in Dragonlord chronicles? I am not totally sure that is the location where I remember it, and even if so what was written about it. Last edited by Robin on Sat Jan 19, 2019 2:52 pm, edited 1 time in total.